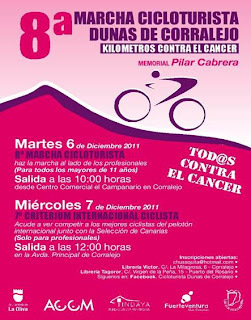 Corralejo, Fuerteventura Canary Islands will host the next cycle against cancer on the 6/7th December. 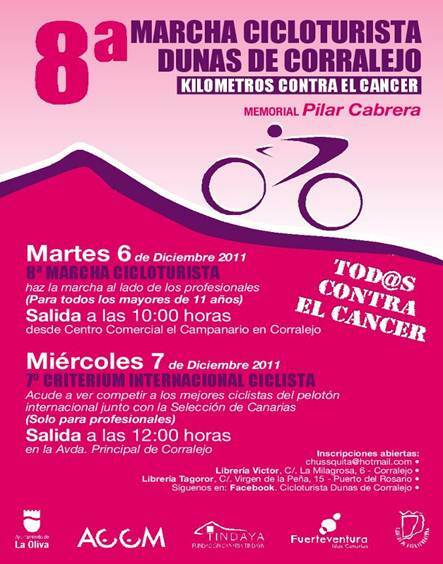 Infact all the money of the registration will be donated to the research against cancer in Fuerteventura. On Tuesday 6th the race will be open for all participants over 11 years old, not for professionals, the race will start in front of campanario shopping centre at 10:00am and on the 7th the competition will be open only for the professionals ,and it will start al 12.00 am in the main street of corralejo. If you want to take part to the contest you can write an e-mail to chussquita@hotmail.com ,or pass by at the libreria victor calle la Milagrosa 6 corralejo, or libreria tagoror calle virgin de la pena 15 In Puerto del Rosario . You can follow all the news at the facebok page cicoloturista Dunas de Corralejo - there’s a fantastic opportunity to do sport, enjoy yourself and do something good!